CAMBRIDGE, Mass.—Microsoft now holds the Guinness World Record for Quietest Place on Earth. 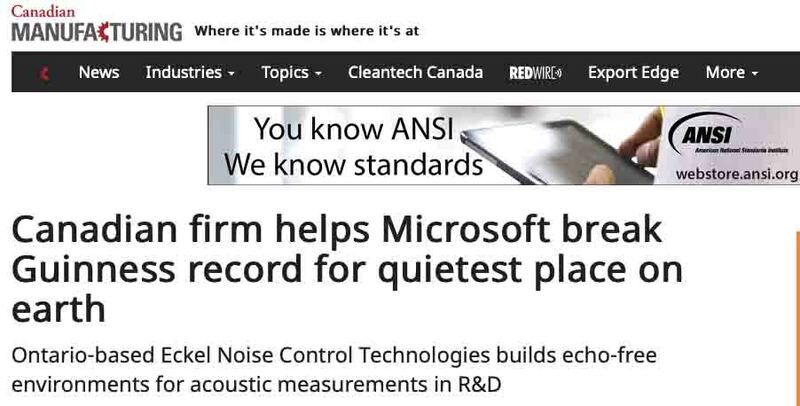 And Morrisburg, Ont.-based Eckel Noise Control Technologies helped the tech giant get there. Microsoft is known as a leader in computer and electronics R&D, and continually invests in upholding that reputation. So, when the company needed a new anechoic chamber for audio and device testing at its Redmond, Washington Audio Lab, the engineers aimed to create a truly state-of-the art acoustic environment. What they didn’t realize was this: they were designing something truly unique—the absolute quietest room on the planet.